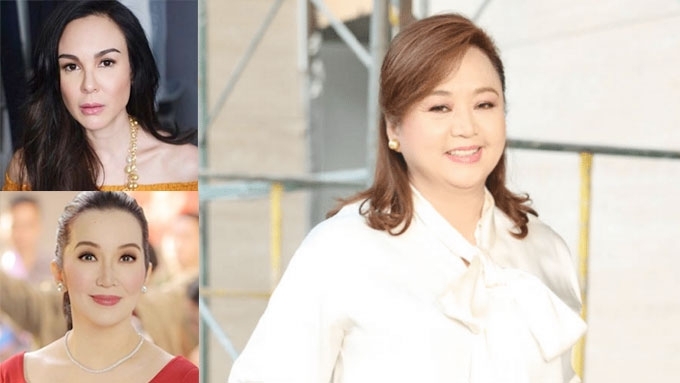 Alice G. Eduardo, businesswoman and philanthropist, is caught in the crossfire between Gretchen Barretto and Kris Aquino. Alice G. Eduardo is a businesswoman and philanthropist whose name has been dragged in the online clash between Kris Aquino and Gretchen Barretto. Apparently, for the simple reason that the two warring stars are both Alice's friends. The public got a whiff of all this when Gretchen publicly showed support for Nicko Falcis, a former top executive in Kris's production company whose current turmoil with Kris has blown up into a major controversy that has roped in personalities not involved in the case. Kris's supporters began calling Gretchen “sawsawera,” literally meaning a meddler, which, expectedly, triggered more salvos from Gretchen. How has Alice Eduardo—founder, president, and CEO of Sta. Elena Construction and Development Corporation, a top-tier construction and engineering company—gotten herself into this picture? Alice's company built the foundation work for Okada Manila, a luxury hotel and casino owned by Tiger Resorts Leisure and Entertainment Inc., in which one of the directors is Gretchen’s long-time partner, Tonyboy Cojuangco. Tonyboy is the son of the late business mogul Ramon Cojuangco, brother of the late President Corazon Cojuangco Aquino, the mother of Kris. Kris, in a recent Instagram Live session, acknowledged that Alice is her friend. Gretchen, in her own January 18 Instagram Live session, said that Alice is her friend, but that she had issues with a sibling of Alice over some "businesses." In the same IG Live session, Gretchen made the claim that Kris had intervened for Alice in a tax case with the Bureau of Internal Revenue by going directly to her friend Kim Henares. This was, according to Gretchen, during the presidency of Kris’s brother, Benigno Aquino III, when Kim was the BIR commissioner. Today, Kim is the personal accountant of Kris. Gretchen, meanwhile, also made public her personal issues with Kris, which she said included Kris's use of power to get into Gretchen's life. Gretchen's focus in her January 18 IG Live, however, was Kris's supposed use of power in the case of Alice: "Nagkaproblema po si Alice Eduardo sa tax niya po dito sa Pilipinas. "She was being charged lots of millions or billions of pesos po, at tinulungan po ni Kris Aquino. "If I’m not mistaken po, para mapababa ang kanyang ibabayad kay Kim Henares o sa gobyerno po natin. Gretchen also claimed that, in exchange, Kris constantly received designer bags, shoes, and clothes purchased from abroad. Kris did not confront Gretchen. Instead, her lawyers issued a statement saying Kris never intervened for Alice in any pending tax case and that the records prove that Kris has been one of the top individual tax payers of the country. They stopped short of threatening Gretchen with a lawsuit. For her part, Kim issued her own statement saying Gretchen's whole story was fiction. Alice moves in high-society circles and is also well-known in showbiz. Among her close showbiz friends are Pops Fernandez, Marjorie Barretto, Dawn Zulueta, former actresses Cristina Gonzalez-Romualdez and Joy Ortega, and talent manager Jojie Dingcong. She was a guest at Vicki Belo and Hayden Kho's exclusive Paris wedding, and was a godmother at the wedding of ABS-CBN broadcaster Anthony Taberna and Rossel. Kris and Alice are magkumare, as they are both ninangs to celebrity stylist Kim Yap. Alice is particularly known in showbiz as a benefactor of the Walk of Fame in Eastwood, Libis, Quezon City, a project spearheaded by the late star-builder German "Kuya Germs" Moreno. In 2015, Alice and Gretchen were involved in an issue that the actress herself made public. In March of that year, Gretchen posted on Instagram a text message from an anonymous sender questioning her association with Alice. At the time, Gretchen had been posting flowers and gifts she had received for her 45th birthday, which fell on March 6. Gretchen’s initial response was to expose the sender’s cellphone number, and to say that she had traced who among her “so-called friends” owned it. In a subsequent Instagram post, Gretchen said that she let the incident go after receiving a call from her friend Alice. Also at Alice's request, Gretchen deleted her previous post that had the sender’s number. “Alice lovingly asked me if I could kindly delete the post I made regarding the missent text message last Sunday because it was causing too much tension for all involved,” read part of Gretchen’s caption. Dubbed "Woman of Steel," Alice had wanted to become an engineer, but to please her parents she took up a management course in college. Their family businesses in Nueva Ecija included rice milling, trading, and exporting, and it was while doing a delivery to Concrete Aggregates in 1995 that Alice changed the course of her life. Concrete Aggregates had a construction project in Malolos, Bulacan, and had asked her to supply steel splices for them. Alice grabbed at the chance, delivered the products in person, and went on to start Sta. Elena Construction and Development Corporation. A mother of three, Alice had the motivation to prove herself in a male-dominated field. Back then, she faced a two-pronged challenge: to be taken seriously not just as a woman but as someone with no formal education in engineering. “A possible scenario then was that some in the industry would try and leverage their so-called male-dominated culture during meetings,” she told Philippine Tatler in a December 2018 cover feature. Sta. Elena now specializes in building power plants, infrastructure, and foundation work. It is an AAA and Large B firm with at least PHP300 million in capital, which qualifies it to bid for billion-peso projects. Alice’s company has, in fact, outbid international construction firms for plum projects for Siemens, Europe’s largest industrial manufacturing company—the Sta. Rita Power Plant, San Lorenzo Power Plant, and San Gabriel Power Plant, all located in Sta. Rita, Batangas. It also built the foundation for several SM malls, including the Mall Of Asia complex and Aseana City in Pasay City. Sta. Elena also did the foundation work for Solaire Resort & Casino, City of Dreams Manila, Manila Bay Resort, Okada Manila, and Resorts World Bayshore. The company has handled the construction of huge infrastructure projects, including the Sarrat Bridge in Ilocos, the expansion work for NLEX and SCTEX, and the Total Petroleum Loading Jetty in Bataan. The 53-year-old businesswoman seems to have strong family ties as well. Alice is surrounded by her octogenarian parents Andres and Elisa; her three siblings Small, Melba, and Joel; and her three children Jacqueline (23), Jameson (21), and Jessica (19). Philanthropy also seems to go hand in hand with her business, with Alice supporting several charities and causes. Aside from subsidizing young scholars, she is said to have built homes for Yolanda victims and, moreover, has worked with Habitat for Humanity for some time. She is known to support the Red Cross Charity, Young Musicians Development Organization, and Philippine Cancer Society, among others. Alice funded the Pediatric Hematology-Oncologist Isolation Ward at the Philippine General Hospital, which was inaugurated in February 2018. She is also a patron of Tuloy Foundation, a sanctuary for homeless street children. As a businesswoman worth billions, Alice looks more focused on putting out fires rather than fanning flames. This is probably the reason Alice has done it all: remained mum on the tax issues Gretchen has raised, steered clear of the Gretchen-Kris issues, and is still, by present indications, a friend to the two warring stars.